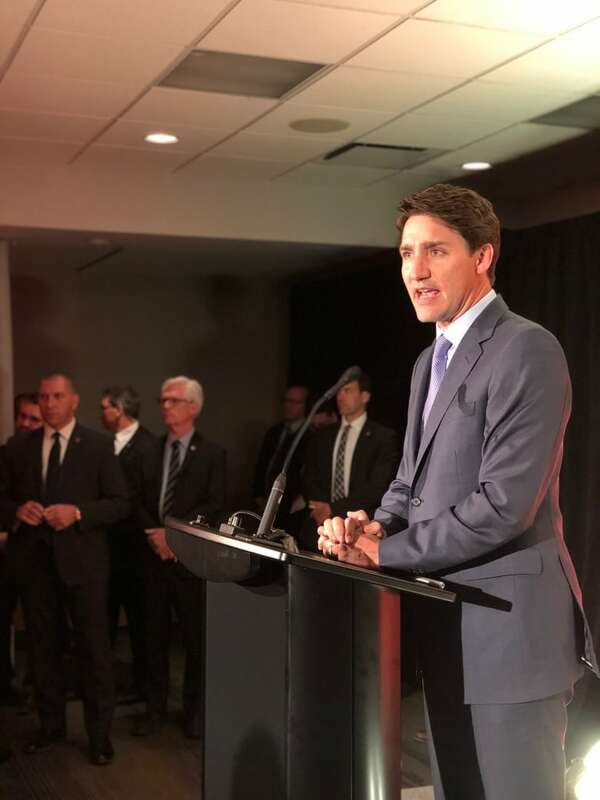 Prime Minister Justin Trudeau spoke to his supporters at a Liberal donor appreciation event Monday evening, the first event in his two-day stop in Winnipeg. During his speech, he highlighted the successes of his government, which is currently embroiled in a major controversy as it seeks re-election in October. "Right now [the Conservatives are] scrambling. They have nothing to say about our budget, they have nothing to propose as an economic plan to go up against ours, so they try to change the channel," Trudeau said. "We're going to stay focused on Canadians … let the world look to Canada as a model." The SNC-Lavalin controversy continues to reveal more details about the prime minister's suspected tenuous relationship with former attorney general Jody Wilson-Raybould. Sources told The Canadian Press on Monday the former justice minister's choice for chief justice of the Supreme Court was a moment of "significant disagreement" with Trudeau, suggesting the prime minister could have had other reasons for removing Wilson-Raybould from the portfolio. Even the most ardent Liberal supporters wanted more clarity on the SNC-Lavalin controversy, and the subsequent exits from cabinet of Wilson-Raybould and former treasury minister Jane Philpott. "I think it would be good if the affected ministers could state their views as far as the party is concerned," said George Tabisz, a retired physics teacher who's been a party member since the mid-1960s. "There's time between now and October to discuss and make changes if needed." When it comes to Manitoba, other than jobs, Tabisz hopes the Liberals, if re-elected, make the topic of child poverty a greater focus. The event, held at the Inn at the Forks, was the second fundraising event of the day for Trudeau, who was in Nanaimo, B.C. earlier Monday. During his speech, the prime minister focused on the failures of the past Conservative government, indicating the party, now led by Andrew Scheer, is a warmer version of the same. "The Conservatives — what are they offering? Balancing the budget by cutting programs and services while giving advantages to the wealthiest," Trudeau said. In his speech, Trudeau cited his government's rebuilding of its relationship with the Manitoba Métis Federation. "We've focused on respect and shared partnerships and Ottawa being a partner to our Indigenous brothers and sisters," he said. Media were not allowed to ask questions at the event, which is common at party fundraising events. On Tuesday, the prime minister will visit the Manitoba Institute of Trades and Technology with Jim Carr, minister of international trade diversification. Following the tour, media will have the chance to ask questions. Trudeau and Carr will then meet privately with the Richardsons, finishing his tour of the city with a visit to the Manitoba Federation of Labour. An interview with the prime minister will air on CBC Manitoba's Up to Speed on Tuesday afternoon at 4:05 CT.